Pseudomonas aeruginosa is a well-known clinical pathogen for its recalcitrant infection caused by biofilm formation which are initiated by flagella-mediated attachment. Sodium houttuyfonate (SH) is a natural phytoanticipin derivative of houttuynin and has anti-pathogenic effect on P. aeruginosa biofilm formation. 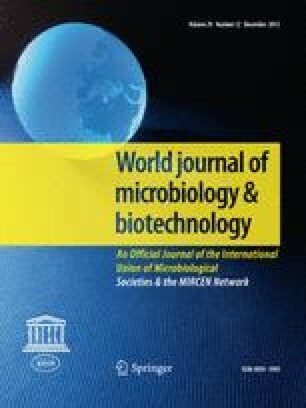 In this paper, when using 1/2 × MIC SH, the diameter of P. aeruginosa swimming motility was sharply shortened to 36 % in 24 h incubation, and the fold changes of fliC required for swimming motility was 0.36 in 24 h cultivation, the adherence inhibition accounted for about 46 %, and the pyocyanin production decreased to 47 % after 1-day treatment and 56 % after 3-day treatment with obvious visual changes from dark green to light green, compared with the negative control. With the help of mass spectra and scanning electronic microscope, 1/2 × MIC SH was further testified to be enough to eradicate flagella and inhibit pyocyanin secretion of P. aeruginosa. The results do not only re-affirm the close interplay of attachment and virulence (i.e. swimming motility and pyocyanin), but also unravel the potential mechanism of SH on anti-biofilm of P. aeruginosa. The online version of this article (doi: 10.1007/s11274-013-1405-2) contains supplementary material, which is available to authorized users. This work was supported by the National Natural Science Foundation of China (No. 81173629).